Just like you shouldn’t depend on WebMD for a real medical diagnosis (prepare the stretcher, I’ve got...heartburn), you shouldn’t turn to Google for legal advice. The problem is most traditional law firms don’t offer cost-effective solutions for the legal issues that small businesses encounter. Navigating the legal complexities of your company can be tricky. Say hello to Sparqa Legal, your expert legal guide and resource. Sparqa Legal provides you with cost-effective legal guidance and documents to help you stay on the right side of the law. The majority of businesses stick their heads in the sand when it comes to legal issues, and the rest balk over crazy fees to attorneys. 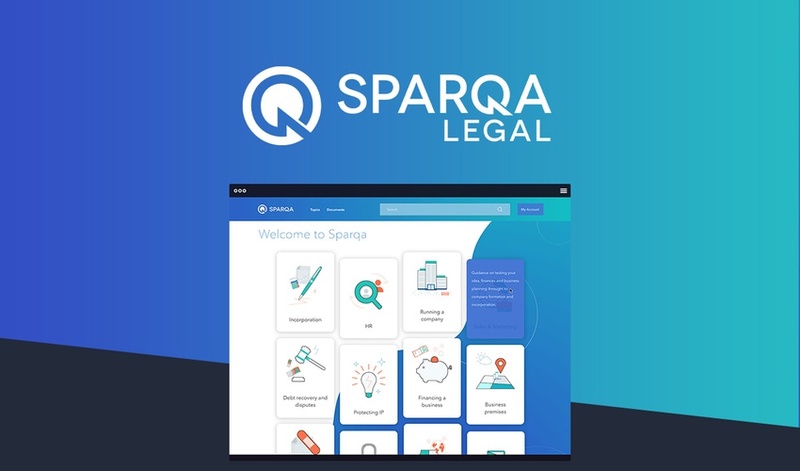 Sparqa Legal allows you to quickly find the solution to your legal problems with proprietary software designed for ease of use — you won’t find complex legal jargon here! 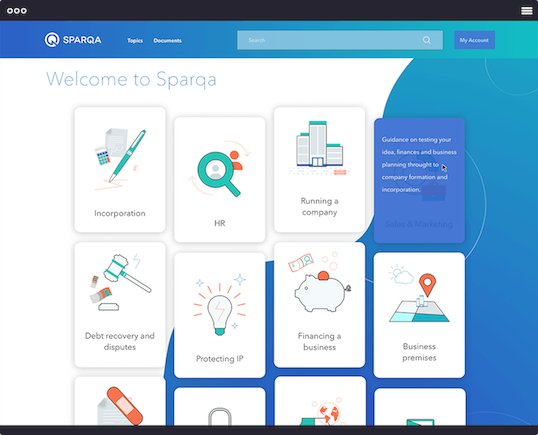 Developed by dedicated lawyers and engineers with a proven track record in the legal publishing and tech market, Sparqa Legal gives you guidance in 10 major topics. Need help with incorporation? Sparqa Legal’s got everything you need. From choosing a name to drafting the company constitution, you’ll be able to incorporate your company and ensure proper governance. Protect your intellectual property with easy-to-follow advice on registering trademarks, applying for patents, protecting designs, and establishing copyrights. Whether it’s staff contracts, time off work, or rights for parents, Sparqa Legal is your resource for all things human resources. Dealing with debt recovery and disputes is tough — Sparqa Legal has your back with topics from running a small claim to chasing big debts. Sparqa Legal’s also got you covered in a ton of other areas when it comes to running your company — sales and marketing, financing, selling a business, business premises, and our ol’ pal, GDPR and data protection. Plus, the software’s strict editing process ensures that content is constantly reviewed and kept up-to-date. And Sparqa Legal doesn’t stop there. Sign along the dotted line for the trustworthy and simple contract builder from Sparqa Legal, which lets you create legal documents in minutes. Business owners and managers everywhere trust Sparqa Legal for all things related to company law. If you object to legal fees that feel more like highway robbery, AppSumo’s got your back. Normally, access to legal info this good would cost you a pretty penny. But you can score one year of access to the Sparqa Legal Business Plan fo’ free! Protect your business with Sparqa Legal today! Unlike other legal platforms, Sparqa Legal covers the entire business cycle, including legal, HR, and compliance issues. Just “Googling it” might seem like a good idea, but it could land you in some serious heat (think the last few sauces on Hot Ones). So why deal with outdated contracts and dodgy legal advice from armchair online “experts” when you could rest assured with content written by leading lawyers, plucked from top tier law firms. Sumo-ling, I'm going to give you it to you straight. You're most likely not Elle Woods and you most likely did not attend Harvard Law. 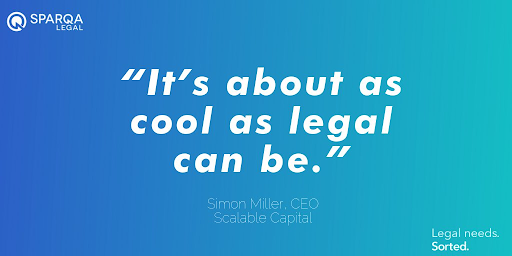 But you can get a grasp on all your company’s legal stuff (what, like it’s hard?). Need legal guidance? Better call Sparqa. Get 12 months free access to Sparqa Legal now! P.S. While Spara Legal is definitely helpful, the content is best practice. We encourage you to seek legal counsel for serious matters. Please note: This deal is not stackable. Please sign in to ask a question or leave a review. All our deals are time-sensitive! Make sure you don't miss any of our awesome limited-time offers. Sparqa Legal: This. Is. Sparqa!